The single most persuasive argument against localism in the UK must surely be the daft provincial laws we regularly laugh about from the US. Boulder Colorado seems proud (?) to further enhance this odd American tradition. 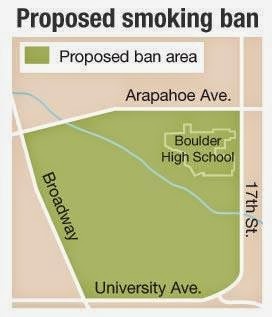 City Council members signaled that they’re not done trying to stamp out public, outdoor smoking — at a meeting Tuesday night, George Karakehian warned businesses and residents of the student-heavy University Hill area that “it’s coming” to their neighborhood as well. I bet they're shitting themselves. To adequately enforce this, city cops will be crawling all over the 500 acre exclusion zone, obviously. There'll be hundreds of them working in shifts! Still, at least all that huge extra expense to taxpayers is directly targeted at solidly evidence-based harm to the community, eh? The ban prohibits smoking tobacco and e-cigarettes in alleys behind businesses, within 25 feet of a bus stop, on all walking and hiking paths through city parks (and within 15 feet of those paths) and on all city-owned open space, according to the Daily Camera. So which workers are harmed by smoking outdoors exactly - don't they have cars in Boulder? Is this a Flintstones feet-through-the-chassis thing? And how many bystanders have been proven to have suffered harm from e-cig emissions 25 feet from a bus stop or, err, anywhere? Better arm those legions of cops with binoculars and water vapour detection equipment, cos I reckon I could vape standing directly behind one of them and they'd be none the wiser. Because it should only be drunk if unopened? ... and peeing in the bushes to jailable offenses. Jail for pointing Percy? We're surely at peak pointless pontification here, aren't we? Violating the [smoke and vapour-free] ordinance would be a municipal infraction that normally costs about $100, but fines can range as high as $1,000 and up to 90 days in jail for repeat offenders. "I get more grief about this issue from my friends than any other issue, that Boulder is becoming a nanny state," [Councilwoman Suzanne Jones said]. As I've mentioned before; the smaller the state, the more stupid and totalitarian the politicians who run it. Yes, the beleaguered Boulderites are believedly bashing their bonces on basalt obelisks because the bastards are breaking the bounds, breaching the borders of bigotry. It does seem to be the case, doesn't it? Which should be a bit of a problem for libertarians who blindly support secessionist movements on the basis that a territorially smaller state must, ipso facto, be smaller in scope. In fact, I'd say that it betrays an inconsistency in thought: the idea that a smaller territory is favourable because the government of a small area can cause less harm is collectivist; ie, the total amount of harm that can be caused to all humanity is lessened. But to the individuals subject to that government, it can, as we see, be greatly increased. Localism isn't really any closer to individualism than any other variant of statism. Are Nicorette 'QuickMist' and 'Inhalators' included in this ban? If not, I think there would be grounds for litigation based on blatant discrimination. Interesting too, marijuana was just legalized in Colorado, now this, total outdoor banning with $1,000 fines and a jail term for breaking the outdoor tobacco smoking and e-cig vaping ban. In California, often, promoters for legalized marijuana are also approving of any and all anti-tobacco legislation, thinking it enhances their chances of successfully becoming legalized. I.e, they want tobacco made illegal and marijuana made legal, not both at the same time. So this happening now in Colorado, head after heels of them just making marijuana legal might be a bit of progressive back-room deal making all along, which was to promote one while demoting the other, something California pro-marijuana legislation people are commonly of the bent. 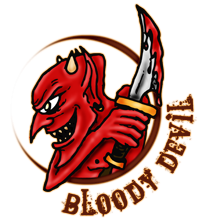 Just saying, it's interesting, first one thing happens, now the other shoe is falling into place almost immediately afterwards, strange "coincidence" maybe. When I lived in Denver the people there said that Boulder was "five square miles surrounded by reality". If I remember correctly Arapaho is the main artery carrying traffic north from Denver are they going to stop people smoking, or gaping, on a highway?